Brigadier John Lawson, initially commanding the Island Infantry Brigade, established his Brigade HQ at the cluster of splinter proof shelters situated on the lower slopes of Mt Nicholson just above Wong Nai Chung (WNC) Gap Road. On the other side of WNC Gap Road there was a semicircle of splinter proof shelters that were utilised by 'D' Coy Winnipeg Grenadiers. 'D' Coy shelters were located on the hillside between WNC Gap Road and Blue Pool Road. In December 1941, Blue Pool Road ran up to WNC Gap from Tai Hang Road. At the junction of Blue Pool Road and WNC Gap Road there was a group of three splinter proof shelters which were used as an Advanced Dressing Station (ADS). The ADS was only about one or two hundred metres from West Brigade HQ. The Medical Officer in charge was Captain Barclay, assisted by several RAMC orderlies and ten Chinese St John Ambulance Brigade orderlies. At least one of the brigade clerks (Intelligence Section) was accommodated at the ADS because of shortage of bunk space at Brigade HQ. To the south of the ADS was a mound on which there was a small police post (referred to in most accounts rather extravagantly as a police station). Today the mound is the home of Stanley Ho, and carries the impressive address of No. 1 Repulse Bay Road. On the 19th December 1941, the three Japanese Infantry regiments, each utilising two of their three battalions, having landed on the North Shore the previous night, were all converging on WNC Gap, and as result West Brigade HQ and 'D' Coy shelters found themselves in the front line. 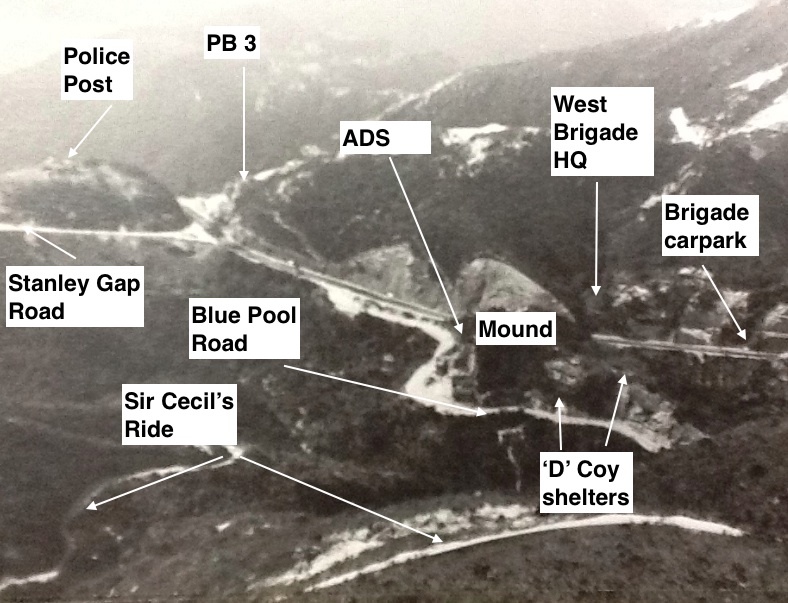 The Japanese quickly captured the ADS, the police station, Stanley Gap AA Battery, and were on the slopes and crest of Jardine's Lookout directly opposite West Brigade HQ. At around 1000 hours Lawson left his besieged bunker with a small group of staff officers and orderlies and was shot in the leg by machine gun fire and bled to death outside his HQ. All efforts to relieve Brigade HQ and extricate the brigade commander, and recapture WNC Gap failed despite great gallantry in the execution of these counterattacks. Some of the brigade staff were able to get across the road and join the garrison at 'D' Coy shelters, but later the road was covered by Japanese machine guns, and it became impossible to get across. Some managed to get up the hillside behind West Brigade HQ, but there was no shelter or dead ground, and with out the tree cover and lower vegetation, several of those who took this route to try and extricate were killed or wounded. The survivors on the hillside, feigning death, waited until dark and then made their way back to Brigade HQ. Those that were able to do so, dashed across the road to 'D' Coy shelters, before dawn, but even in the darkness some were killed as they left the passageway and ran across WNC Gap Road. This left only the dead and wounded at Brigade HQ. The wounded were placed in the open shelter nearest the road to facilitate their evacuation by ambulance, although this never occurred as ambulances were unable to get up the road to WNC Gap. The Japanese were on the hillside above Brigade HQ shelters but did not come down whilst the garrison at 'D' Coy shelters were holding out. The photograph below shows two of the three rear bunkers protected by the blast wall. Brigadier Lawson had his command HQ and telephone exchange in one of these three bunkers. Bill Greaves, historian and heritage consultant, believes it may have been the third bunker from the left. The photograph shows the first and second bunker. The third was located at the end of the passageway and is today largely buried (see later photographs). On the surviving bunkers some of the original steel doors still remain as can be seen below. 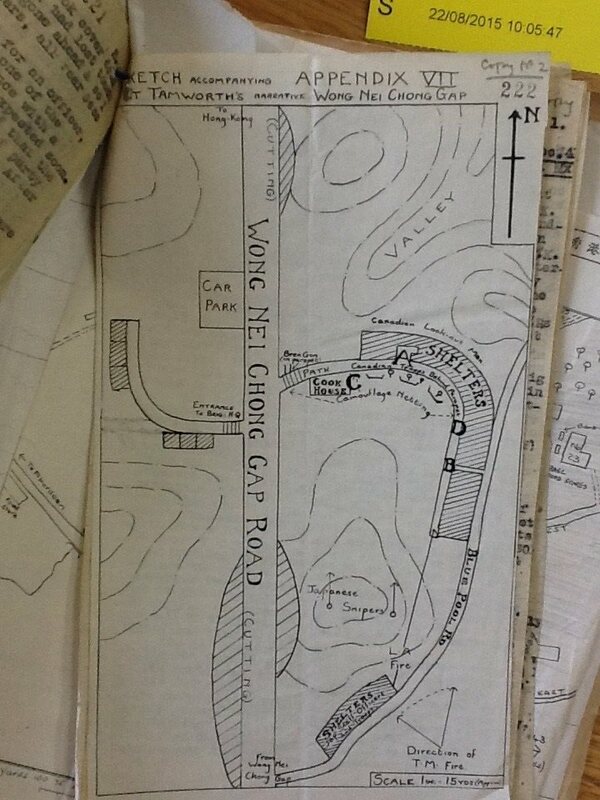 The war time diagram depicted below shows the rough layout at Brigade HQ and at 'D' Coy shelters in December 1941. The diagram shows the three rear bunkers at Brigade HQ and the brigade car park. The car park was located where the petrol station now stands. The mound north of the ADS shelters (top of Blue Pool Road) was occupied by Japanese snipers who were able to lob grenades and fire onto 'D' Coy positions. The mound can be seen in the 1947 photograph at the bottom of this post. 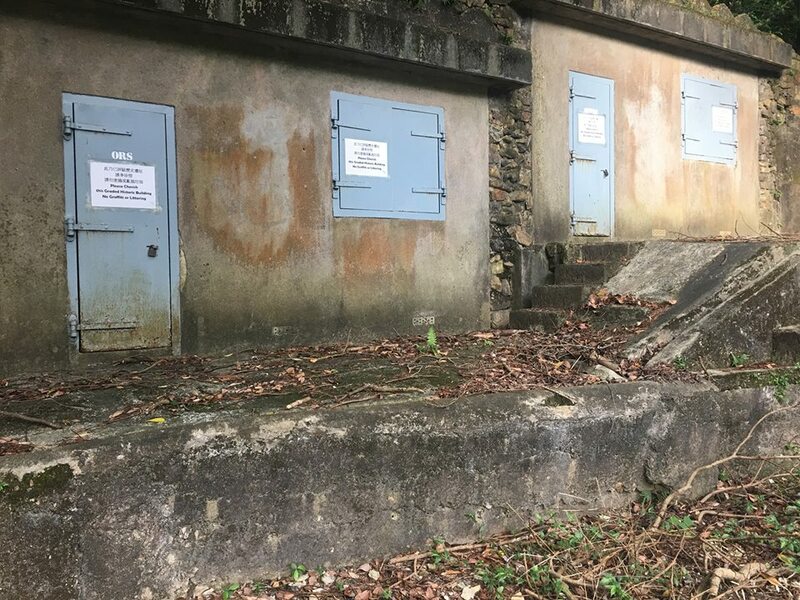 The upper section of Blue Pool Road no longer exists and the steep valley (Blue Pool Valley) to the east of Brigade HQ has been filled in and now accommodates the Hong Kong Cricket Club, municipal tennis courts and part of the French International School. Only the shelters at Brigade HQ and the nearby pillbox (PB 3) remain today as a physical testimony of the battle at WNC Gap. Like most war structures in Hong Kong they have received little attention and are dilapidating as time goes by. Last year (2017) the structures at Brigade HQ were vandalised by a small number of students from the nearby French International School. Steel doors and walls were spray painted with graffiti by youngsters who should have known better, and probably knew little about the war history, the lives lost, or about the military remains around their school. The authorities, to their credit, were quick to clean up the damage and restitute the structures. They have also installed a cabin for a caretaker located at the set of two stand-alone bunkers further down the road. Today the site is littered, untidy and in my opinion unsafe, because a large tree is in danger of falling - see the photographs below. I have notified the Antiquities and Monuments Office. If the tree collapsed it would cause further damage to these historic structures, which should be considered a war shrine and should be cherished. It could also cause injury to persons visiting the site. The tree leaning over the site. The third bunker at the rear is missing. It is partly buried and may have been damaged by the slope-maintenance work behind the petrol station. 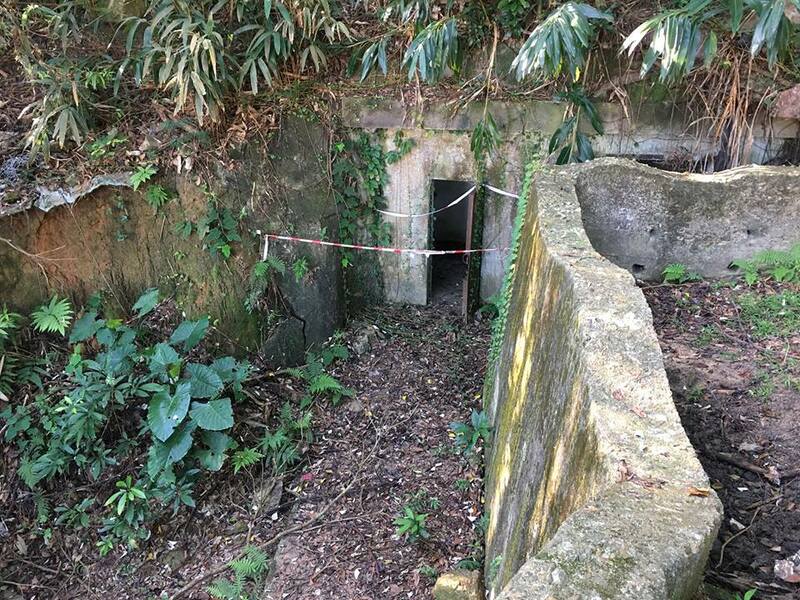 This ought to be dug out and restituted because it may well be the actual bunker occupied by Brigadier Lawson, situated at the end of the passageway. The photograph below shows the passageway leading to the three rear bunkers. This next photograph shows the two surviving rear bunkers - the third is buried where you can see the sheet of corrugated iron. To the right of the sheet of corrugated iron we can make out the front upper section of the third bunker and above it on the slope we can see the tall ventilation shaft for this "missing bunker." In the photograph below we can see the roof of the two rear bunkers which are hidden and protected by the blast wall, and we can see the slope above the bunkers whereby some of the staff officers and Other Ranks tried to extricate. In the next photo you can see that the passageway has at some stage been filled in to construct the concrete drainage channel. The drainage channel disecting the passageway. This shelter looks like a garage, but it was not, as vehicles were parked at the nearby brigade carpark. In contemporary accounts it is described as the "open shelter" and it was closest to where the passageway reached the road. The photo below shows the petrol station which occupies the area that once formed the brigade carpark. The vehicles including Lawson's car were hit by shell fire on 18th December and all the vehicles were reported to have burnt out. Brigadier Lawson planned to use Captain Barclay's car for going round the posts. Captain Barclay was stationed at the ADS at WNC Gap. His car was parked outside the ADS, about one hundred metres or so from Brigade HQ. I have no idea what the small structure is in the centre of the photo below, or whether it's a wartime structure. It has a small access door and it is painted in modern style disruptive pattern. On Sentosa Island in Singapore you sometimes see this kind of renovation and paintwork on war structures. I actually think it makes them look fake. Renovation that restores structures to how they actually looked would be more appropriate and acceptable. In Hong Kong very little has been done to preserve and protect war structures, in fact in the urban area many such structures have been destroyed for building or road construction. In the rural areas there are still many war ruins remaining including, batteries, splinter proof shelters and even trenches and weapon pits. Sadly as each year goes by they are increasingly denuding and dilapidating. The only positive thing, is that because of this benign neglect, they are mostly in their original condition, and as a result have a more authentic charm. Below is one of ten information boards located at intervals around the WNC Gap Trail. This one at West Brigade HQ has been tastily done and provides the visitor with useful information. We need more of these in Hong Kong, and better maintenance of wartime structures. The litter should be cleared out and the undergrowth cut back. There is an additional cluster of two splinter proof shelters to the north of the petrol station (the site of the brigade car park). This set of two splinter proofs is about 100 to 150 metres from the rest of Brigade HQ. These buildings are more exposed, and are unprotected by blast walls. The shutters and doors are in too good a condition to be original and the hinges seem to be on the wrong side. They are original splinter proof structures that have been modernised by the addition of new shutters and doors which have been painted grey and signs like ORs (Other Ranks) and Officers painted in white on the doors. I have no idea who did this or why, but they don't look very authentic, but perhaps at least better than the gaping doors and apertures or bricked up doors and apertures that we see on so many other such structures. Below is a photo taken from "The Ruins of War" by Tim Ko and Jason Wordie (1996) which shows the same set of shelters with their doors and shutters removed and the apertures bricked up to prevent illegal occupation. It is not clear who occupied these two structures in December 1941. I did hear from one historian that a veteran had told him that at least one of them was occupied by signals staff. The Brigade Signals Officer (Captain Billings) was in Lawson's bunker, and he probably had one of two signalmen with him manning the telephone exchange. It is possible that these shelters were used for accommodation for Royal Canadian Signals Corps including dispatch riders, but we are not sure, perhaps a reader can throw some light on this. The annotated photograph below is taken from West Brigade shelters looking over the Blue Pool Valley towards the western slopes of Jardine's Lookout. The photograph was taken c. 1947. 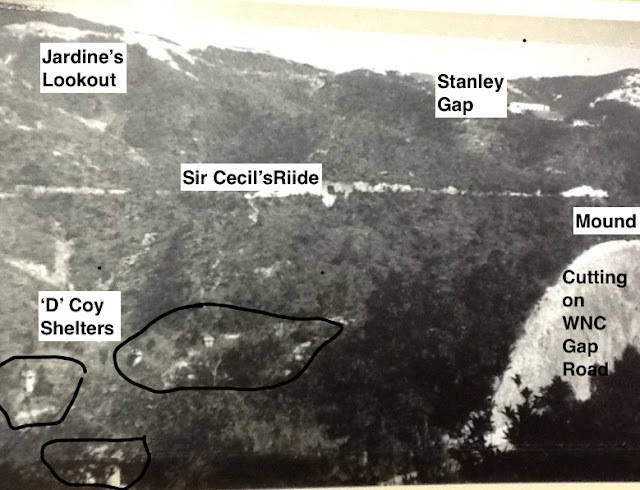 The lack of forestation and the lower undergrowth that prevailed at that time means we can see Sir Cecil's Ride and Stanley Gap very clearly. The garrison at West brigade would have seen and engaged the Japanese at these locations. There was reportedly particularly heavy fire from the captured AA battery at Stanley Gap. This photograph shows the semicircle of splinter proof shelters occupied by 'D' Coy WG. You can clearly see the ventilation shafts. One can see the cutting on WNC Gap Road and get an appreciation of the height of the mound where Japanese snipers were dug in and firing down onto 'D' Coy positions. The next photo is taken from the other side of the valley, from above Sir Cecil's Ride. It was also taken in or about 1947, and shows WNC Gap, the police post, West Brigade HQ and 'D' Coy shelters as it would have looked in December 1941. Phil, I do hope that it is not presumptuous of me to wonder if I am the historian to whom you refer towards the end of your post! Certainly I can confirm that a few years ago I joined a “battlefield reunion,” organized by a Canadian body, here in Hong Kong. Amongst the group were 3 Canadian veterans of the 1941 conflict; 1 from the Royal Rifles, 1 from the Winnipeg Grenadiers and 1from the Royal Canadian Signals Regiment. The latter informed me (and others) on that occasion, that during the conflict he had been serving in the splinter-proof shelter referred to in the article. I recall thinking on the day that the sight of grown men pushing to have their photo taken with him was, to say the least, quite extraordinary! Good Morning Tarquinius : you are indeed the historian who provided me with that veery interesting information and thanks for that further elucidation. Thank you for sharing Philip Cracknell , I have been treading on Sir Cecil's Ride and passing though these ruins of War many many times since I was a 10 years old Boy Scout close to 60 years ago and still remember the old Blue Pool Road leading up to WNC Gap and hearing the war stories from my Dad and those who had survived the War. Thank you once again for bringing me back to those memories even though I still now pass by them frequently by car or by foot (on weekend walk ) as I live nearby in Jardine's Lookout. Thank you Alex. I'm glad you enjoyed the article. I enjoy your posts on FB. Mount Davis Hong Kong - RSM Ford who fought there in WW2 and Leontine Ellis who passed away whilst incarcerated in Stanley Camp Hong Kong.